Read below to learn about what Project Organize 615 is doing in the community and to review featured articles. Amy's appearance on News Channel 5, Talk of The Town. School's out, now what? Tips for planning and organizing your summer. As I reflect on my last client project, I get excited just thinking about what we were able to accomplish. My client described the progression and outcome of her project as “a big step forward,” “transforming,” and “life changing.” She was grateful for the hard work the team put in and the lasting effects it will have on her. She even referred to us as “the dream team.” Each day ended with a warm hug and a huge thank you, filling my tank even more. This is why I founded Project Organize 615! My client is organized and her house is tidy. When she contacted Project Organize 615, her problem was storage. Closets, cabinets, attic space, and storage rooms were full and it was becoming difficult to find things she needed and to put things away. Over the years, like what happens to many of us, the spaces filled up with the normal accumulation of kids’ artwork, school papers, journals, clothes, toys, photos, luggage, art, linens, furniture, seasonal décor, family heirlooms, letters and keepsakes. Add in a couple household moves and grown children who left the nest while all their childhood keepsakes remain behind and organization becomes, at times, overwhelming. The boxes began to stack up. My client felt it was time to edit and organize her home. She said getting the help she needed to organize her house was just like hiring a handyman to make a repair or to complete a project. In fact, this is how she presented it to her husband. She needed help to organize her house just as he needed help to paint a room, change a light fixture or stain the deck. She needed help identifying where to start, putting a plan in place and tackling the work. She called in Project Organize 615 (PO615) to take her house back. She even identified areas of concern in advance by putting notes marked “PO615” around her house. It became her call for help! This article was published in June 2017 . Feature 2: Ready, Set, Get Organized! Clutter and disorganization can create a distraction in your mind and stress in your life. This summer lunch and learn event was a hit! We had a great turn out with 30 neighbors and friends in attendance, all with lots of energy and passion for organization. Amy Delaplain, owner of Project Organize 615, was joined by guest speaker and friend, Julie Berry, owner of Berry Organized Photo Organizing. Lunch was catered by our friends at Giardino Salads Brentwood. Project Organize 615 had such an amazing time at our first LaurelBrooke Lunch and Learn! We enjoyed teaching how to get and stay organized and sharing some simple organization tips and solutions. Berry Organized enjoyed teaching about preserving your memories through photo organization and sharing archival tips. Thank you to all our neighbors and friends who came out! We look forward to our next community organization social event. Be on the lookout for a Fall activity! The feature was written after Amy Delaplain spoke at a local Lunch and Learn event in June and was published in September 2017. Amy helped organize (of course!) the fifth annual Wine, Women & Shoes event in February 2017. Amy was the co-auction chair for this event. The generosity of the Nashville community was fabulously displayed during the fifth annual Wine Women & Shoes presented by Regions Bank. On Saturday, February 18, 2017 more than 650 women -- and a few dozen men -- came together to support the Domestic Violence Services of YWCA Nashville & Middle Tennessee, raising more than $340,000. We are THRILLED to say YWCA’s budget goal was beat and are officially at nearly $345,000. 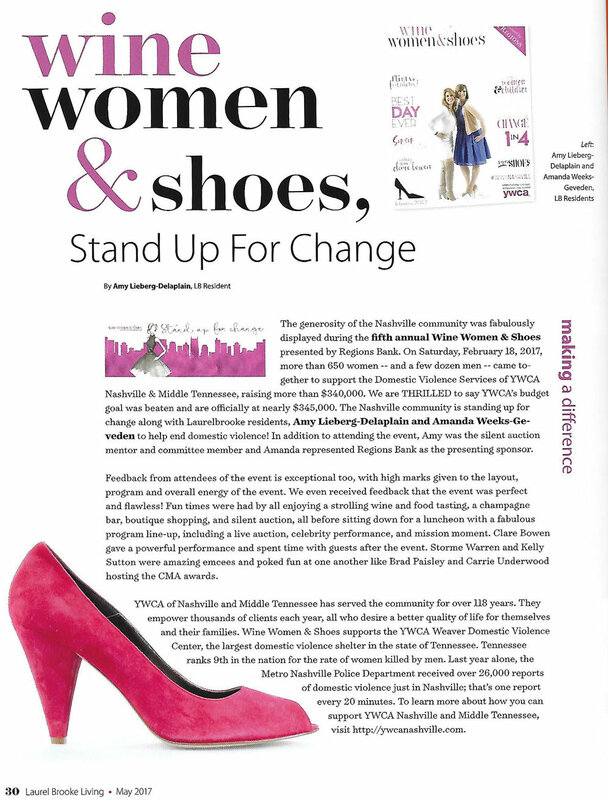 The Nashville community is standing up for change along with Laurelbrooke residents, Amy Lieberg-Delaplain and Amanda Weeks-Geveden to help end domestic violence! Getting organized for any event is an uphill battle, especially when you’re dealing with an event inside an event such as a songwriter’s night with an accompanying auction or a fashion show with an accompanying auction or a gala dinner with an accompanying auction. I think you get the picture – auctions are usually a part of a bigger event. However, they take just as much planning as the main event, if not more. Amy Delaplain is a project manager, professional organizer, and the owner of Project Organize 615. She worked managing large corporate projects before starting her business and she has chaired the auction for charity fundraiser events. She knows the work that goes into planning. “Be realistic about what you can take on. Break down your objectives into smaller projects keeping your schedule and commitments in mind,” Amy said. Amy encourages her clients to get organized by putting systems in place to maintain order and the same can be said for auctions and fundraisers. Having a plan and system to stay organized as you prepare for the event can get you off on the right foot. Bidcoz has been working with auction and fundraising event organizers for several years and has developed a great tool for helping auctions stay organized from planning through the event and post event review. The free, downloadable auction organizer helps event chairs by giving them a head start on how to plan an event nine months out, six months out, three months out and 1-2 weeks prior to the event. For a brand-new auction or fundraising event chair, this tool is worth its weight in gold. It is that first step of preparation already taken care of for you. 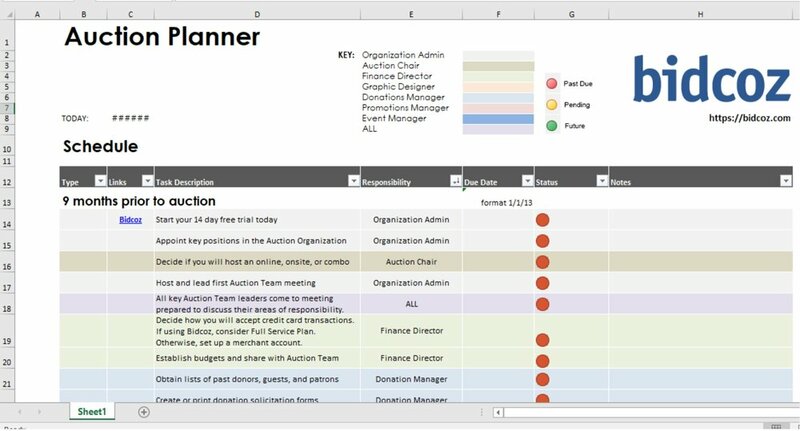 The Bidcoz organizer lays out the early planning work for auction and event chairs, beginning with setting out a list of key tasks, such as, when to appoint key positions for your auction, when to decide what type of auction you want to have (onsite or online or a combo), and even when to secure a venue. It delves deeper into planning letting organizers know when to get materials to the graphic artists for signs and event materials. Planning a big event with an auction can be made easier with the organizer tool as well as with the Bidcoz software suite, which allows you to move much of the bookkeeping and organization online for your team. Why reinvent the wheel when you can just download it? You can download the free auction planner here. Project Organize 615 was honored to participate in the 6th Annual Wine Women & Shoes benefiting the YWCA of Nashville and Middle Tennessee. This year Amy volunteered by setting up and organizing the silent auction display for the event, coordinating donations for the silent auction, preparing swag bags, donating some of PO615's favorite organizing products and PO615's signature consultation to the Key to the Closet. The winner to the Key to the Closet took home the entire collection in the closet valued at over $15,000. Each event attendee had the opportunity to purchase a blinky ring for $50 giving them a chance to win while also helping to pay for a cab ride to take a single woman or family from an abusive environment to safety. Project Organize 615 also donated a PO615 chip clip and a complimentary signature consultation in every Swag Bag handed out to the attendees to take home. Amy is excited to share her passion of organizing with others in the community.